The cutting edge sounds of genre. Utku –S Has dug deep into his sonic tool kit and pulled out all the stops to bring you the cutting edge sounds of genre. Expect to find Chain Saw Basses, Dirty Vocal Leads, Twisted Synths, Hell Raising Wobbles, Euphoric Pads and Spine Tingling Fx. Hard And Dirty Complextro contains 705 24Bit quality samples, including 254 Loops, 451 one shot samples and 100 Sampler Patches. In detail: 56 Punchy Drum and Percusion Loops,15 Glitched Vocal Loops, 20 Complex Music Loops, 105 Bass Loops, 56 Chord Loops, 2 SFX Shots, 25 Bass Multi Sampled Instruments, 62 Drum Hits, 18 Bass Hits, 25 Synth Multi Sampled Instruments, 22 Synth Hits And 3 Vocal Shots. 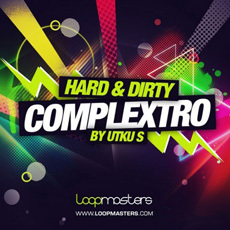 If you need the sounds of Producers like Wolfgang Gartner, Porter Robinson, Mord Fustang to name but a few then Check out Hard And Dirty Complextro Today!